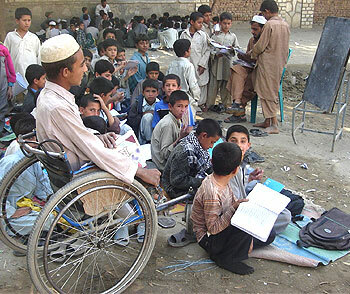 According to the 2005 National Disability Survey of Afghanistan (Handicap International), Afghans with very severe disabilities are 2.7% of the population and those with severe to moderate disabilities are 36.7%. 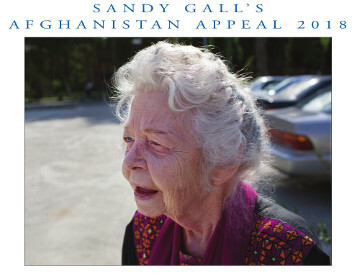 Initially SGAA focused on treating Afghans with war-related casualties and land mine victims as well as children in the refugee camps who contracted post-polio paralysis. This focus widened as the rehabilitation needs of many other people with disabilities became apparent: children with cerebral palsy, fractures, club foot, spina bifida, TB of the spine and developmental dysplasia of the hip. Adults suffer from a wide range of permanent and temporary musculoskeletal and neurological conditions due to trauma, disease and work injuries which can be alleviated or prevented with physiotherapy treatment and different assistive and mobility devices. Each individual who arrives at the centre is initially assessed by a physiotherapist and then referred to relevant services – prosthetics, orthotics, or orthopaedic surgery. In the prosthetic and orthotic departments we make prostheses for amputees, lower limb orthoses for children suffering from polio, corsets for spinal TB and orthoses for other deformities due to injuries and contractures. 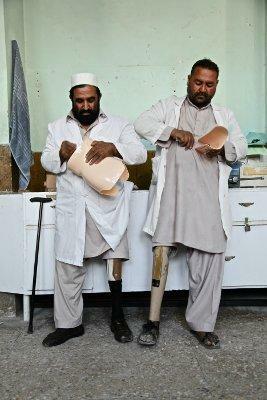 The Afghan technicians are trained to assess, make and fit prosthetic and orthotic appliances to a high standard, using a mixture of local and imported materials. Polypropylene plastic is used for the manufacturing of prostheses and orthoses in Afghanistan as it is relatively easy to use and it is strong. Afghan men and women technicians are trained to produce a range of appliances with practical on the job training and theoretical classes. 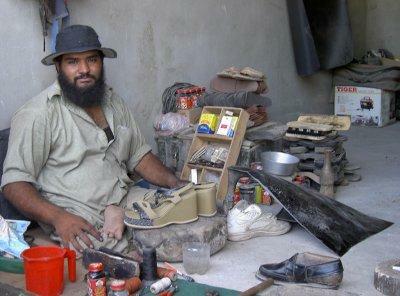 Many technicians are skilled craftsman such as boot makers and welders but lack theoretical knowledge. There is a standard two year training with curriculum approved by the Ministry of Public Health which 150 technicians in the country have passed with support from International Committee for the Red Cross (ICRC). A three-year course has also been started by ICRC in Kabul with the curriculum approved by the International Society for Prosthetists and Orthotists (ISPO). Initially employed as a female guard at Kabul Orthopaedic Organization (KOO) to check women patients arriving at the rehabilitation centre, Mahpekai learnt to read and write with the encouragement of the Director of the Centre, Mrs Gul Makai, a former head mistress. 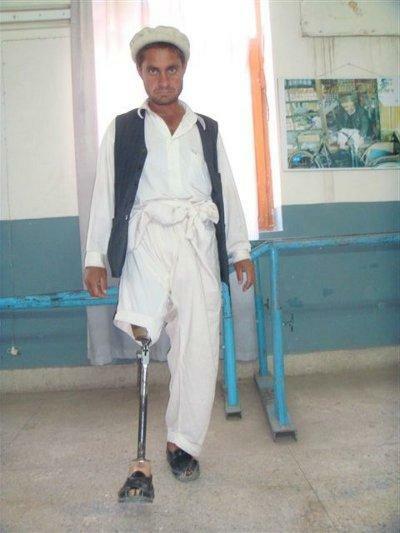 Mahpekai then worked as a trainee technician for several years before enrolling in a 3 year prosthetic and orthotic technology course run by ICRC in Kabul. She is now a fully qualified technologist and supervisor of prosthetics and orthotics at KOO. The component workshop produces 200 components a month such as walking sticks, elbow crutches, chairs for children with cerebral palsy, walking frames and calliper joints. Three different types of wheelchair are also made. The technicians were originally trained by Motivation, a British charity, in the 1990s to produce a three-wheel model. This is ideal for the unpaved streets and rugged terrain in Afghanistan. Later, a four-wheel model produced by SGAA has been updated in 2006 with a model designed by Motivation and TATCOT in Tanzania. Since the 1990s SGAA has also produced a hand-propelled wheelchair, for wheelchair users who want to cover longer distances and run small businesses in the local bazaar. They can apply for skills training and a business loan through the employment support department of the programme. Each physiotherapist sees an average of 10-15 patients a day and gives a range of active and passive exercises according to each client’s assessment. Clients are either referred by local doctors or come themselves to seek help in the physiotherapy clinic. There is very little expert medical support for physiotherapists – such as paediatric doctors or neurologists - so the physiotherapists have to decide what is the disability or impairment and then decide what treatment is appropriate. Some patients with severe disabilities can be treated in their homes, they are identified and referred by SCA’s community based rehabilitation workers. 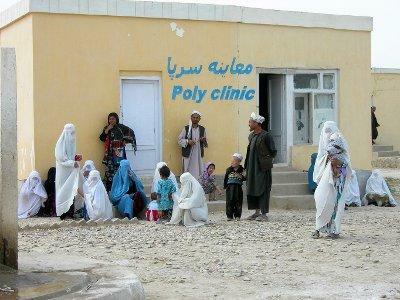 Due to cultural traditions in Afghanistan women have to be treated by women physiotherapists and men by men. Between 1988 and 2007, SGAA trained over 100 men and women physiotherapists in one and two year training courses in Peshawar and Jalalabad. The one and two year training courses and curricula were standardised in the late 1980s when a physiotherapy training school was set up in Kabul under the Ministry of Public Health. Currently there are 305 physiotherapists registered with the Afghan Physical Therapy Association in Afghanistan. Since 2008 a three year curriculum has been approved and existing physiotherapists are being gradually upgraded to this level. SGAA contributed to support of this national upgrading in 2011 by funding one upgrading module in Jalalabad. Once it had set up services in Jalalabad in 1993, and trained sufficient staff, SGAA started a community outreach with its physiotherapists in 1998 in Ghani Khel district hospital, 25 miles from Jalalabad, with the help of HealthNet International and UNICEF. The programme provided physiotherapy services to outpatients coming to the hospital and outlying clinics as well as health education and disability awareness training to local health workers and Traditional Birth Attendants (TBAs). Outreach activities extended to eight other districts in eastern Nangarhar where HealthNet had health clincs and then to Laghman provincial hospital in 2000. In 2003 SGAA received funds from the British Embassy in Kabul to build two permanent physiotherapy clinics in Laghman Provincial Hospital and Kunar Provincial hospital. Permanent physiotherapists were then appointed to work in those hospitals from 2005 onwards. Abdul Sattar is a teacher. He contracted polio at the age of five with the result that his right leg is much shorter than his left. The difference was too great to give him a shoe raise so instead the technician added an artificial foot at the end of his calliper. SGAA has a mother and child physiotherapy clinic in Kabul which it first established with UNICEF funding in January 2001 during the Taliban period. 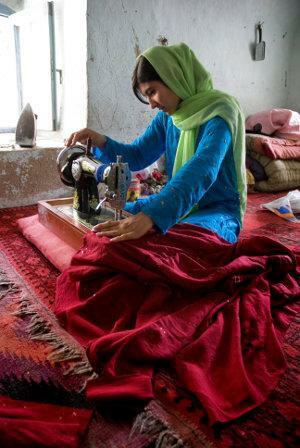 There was a great need to provide services for women and children with disabilities in Kabul at this time as very few professional services were available for women due to the Taliban ban on women working. Fortunately women were allowed to work in the health sector, so SGAA hired an all-female team of physiotherapists. In the last 12 years the clinic has moved several times and is currently based in Afghan Red Crescent Society’s hospital in Khair Khana. A team of two female physiotherapists, one assistant physiotherapist, a health educator and a cleaner works in the physiotherapy unit. From 2004 -2006, with support from Adopt-a-Minefield, an American charity, SGAA started providing loans for wheelchair users and other people with disabilities so that they could start their own businesses. Each applicant had to come up with a plan of action which was vetted by a committee made up of local disabled businessmen and SGAA staff. Many girls and women with disabilities were interested in learning tailoring and embroidery as they could then earn an income in their homes. Teenage boys with disabilities were introduced to craftsmen in the bazaar as apprentices so that they could learn skills over 6-12 months. The master-trainer received tools and a small salary to train the apprentice, while the boys had a stipend to cover their living costs. These employment support activities are also an important part of Swedish Committee’s RAD programme. The community based rehabilitation workers have a key role in identifying women, children and men with disabilities in villages and towns and then educating families and local communities to understand the causes of some disabilities and better prevention. Some disabilities can be prevented through better understanding of hygiene in the home, better nutrition and the importance of vaccination. 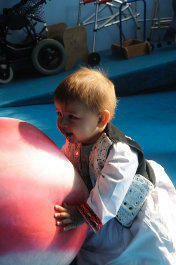 Children with disabilities can also be identified at an early stage and referred for treatment. A good example is the problem of clubfoot. Traditional birth attendants and community midwives in the villages can easily identify children with club feet and refer them to the physiotherapists for plaster casts when the baby is only a few weeks old. If this deformity is not treated then corrective surgery is necessary later on, often with poor results. 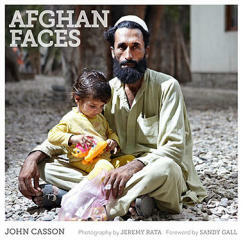 As well as many physically disabled there are also many Afghans suffering mental health problems. Some of this is due to the war and bombing and the stress of losing family members and loved ones or simply the result of the harsh life of poverty. Training in mental health is a part of the course for the community based field workers. The NGO, HealthNet International, also provides training to our staff in how to recognise symptoms of depression and anxiety in patients and what referral procedures should be followed. 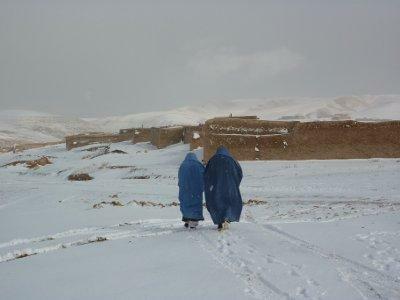 Traditionally Afghanistan has had little knowledge of the importance of physiotherapy and orthopaedic workshop services. Before the Russian invasion in 1979 there were a handful of physiotherapists in Kabul and one orthopaedic workshop. Today through support from aid agencies there are over 11 orthopaedic workshops throughout Afghanistan and over 300 Afghans working as physiotherapy technicians or orthopaedic technicians. Since 1988 SGAA has trained more than 70 physiotherapists and physiotherapy assistants who now work in community-based rehabilitation centres all over Afghanistan and in the refugee villages in Pakistan. Apart from the regular visits of SGAA's own consultants to monitor and evaluate the project, SGAA also sends its Afghan staff on local management and training courses in Pakistan and Afghanistan to improve their skills and increase their ability, one day, to take over the running of the organisation. 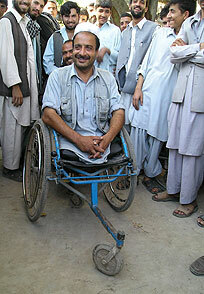 The goal is to create a wholly Afghan organisation which will continue to provide first-rate services for the disabled.